At present, a tendency towards smaller computer sizes and at the same time increasingly inaccessible web content can be noted. Despite the worldwide recognized importance of Web accessibility, the lack of accessibility of web services has an increasingly negative impact on all users. In order to address this issue, W3C has released a recommendation on Mobile Web Best Practices, supplementary to the Web Content Accessibility Guidelines. 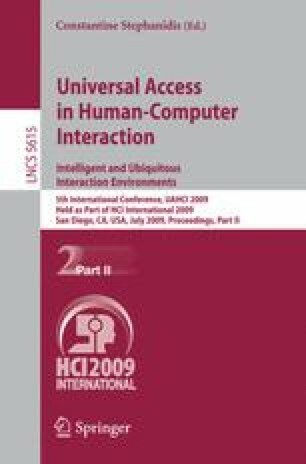 This paper presents the design and prototype development of universally accessible networking services that fully comply with those standards. Validation and expert accessibility evaluation on the XHTML Basic prototypes present 100% compliance. The followed design process is presented in details, outlining general as well as specific issues and related solutions that may be of interest to other designers. The results will be further verified through user tests on implemented services.